With the liver removed, you can observe and access some of the other organs more easily. You can now see the diaphragm, which is a sheet-like muscle that separates the thoracic cavity from the abdominal cavity. The diaphragm serves a critical role in breathing. 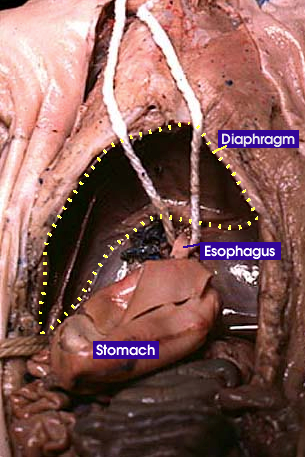 To aid in viewing, a string has been looped around the esophagus, which connects the oral cavity to the stomach.